Cascade Concrete Products is located in Scappoose, Oregon, just 20 miles north of Portland Oregon and 33 miles south of Kelso Washington. 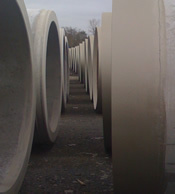 Cascade has been supplying high quality concrete pipe and precast concrete elements for the for the underground construction industry since 1985. Cascade is a family owned and operated business as well as a certified minority owned business. 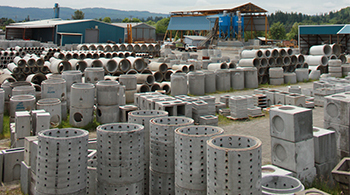 Cascade offers a full line of concrete pipe, manholes, catch basins, drainage structures, storm water retention systems and custom precast elements. CCP has two dedicated production areas; a drycast production facility with five (5) pipe and precast machines and a large wet cast building for pouring large structures, manholes, pipe and custom precast elements. Each facility has a dedicated, automated batch plant with Columbia Machine automation and Haarup mixers which provide the industry’s highest concrete quality. Give Cascade a call to see how their products and personalized service and make a difference in your business. CCP employs five (5) dry cast machines to delivery high strength products. Pipe rages from 8" to 72" diameter, Manholes 48" to 72" diameter and Type I and Type II Catch Basins. The wet cast building employs a dedicated batch plant which can produce very advanced mix designs including SCC (self-compacting concrete). Medium and large diameter products and structures are cast here; up to 144" diameter. If you have needs for a custom precast product or customizing standard products please give us a call. With a dedicated area and personnel to accommodate your requirements. Our design staff can also accommodate your drawing and documentation needs for these components. Your solution is just a phone call away. Cascade owns and operates its own fleet of vehicles to deliver its products to your job site, safely and on-time. CCP also works with a number of “field proven” contract haulers to assist in your product delivery needs. For ocean freight, CCP has worked on a number of projects in the South Pacific and can accommodate the loading and securing open top flat rack containers in their facility.